I might finally get some time to get in some practice welding tomorrow. Thinking a bit about what to use for practice, with a mind toward building up to welding new ends on a couple of hydraulic cylinders for my TNT project (three ball pin sockets, and one large clevis). I've got a lot of 1/8" sheet steel from some scrap equipment cabinets. I've also got some 3/8" plate and 3/8" x 4" x 4" angle stock. Some old 5/8" foundation "J" bolts, a couple odds and ends like an old worn forged clevis, etc. I've also got a bit of 4" x 4" x 1/4" box tubing, but I'd like to save most of that for real projects and not burn it up in practice. Is it easier to begin with big stuff so you can work the puddle more slowly, or would it be easier to work with some of the 1/8" that I have the most of? I've got a couple big chunks of aluminum an inch thick or more, a 22' disk, and a 16" x 24" platform that I was thinking might make a decent work surface for some small pieces? The rod I bought is 7018 1/8", and 6011 3/32", but of course I can get something else, that's just what I happened to get. Given what I have to work with, what seems like a good fit? In general; clean the surfaces bright with a wire wheel, stripping off paint and rust? Cut bevels for thick stuff? For larger joints, tack weld pieces together and then work a bead a little bit at a time from opposite directions to minimize "creep" of the joint from thermal expansion? Clean off the slag of each layer before laying on another bead? A friend said that in his college welding class, the teacher had them weld together two pieces of 4" angle stock, making four of the six sides of a cube, and then lay on layer after layer of weld beads till they had a 4" cube made of nothing but layer upon layer of weld beads framed by the angle stock. Then they took a band saw and cut them in half and were graded on the uniformity and density of penetration with no voids. Seemed like a pretty good exercise. Oh, my welder is a Miller Thuderbolt 225A AC/DC, and I've got a good fat 50A circuit with solid 240VAC (branch circuit coming from a 400AMP service! ), should be plenty of power. And I also have a Hypertherm Powermax600 20-40 amp plasma cutter to cut pieces and patterns out. I am going to be using the gouging tip to remove some welds to get the 3/8" angle stock loose from a large plate. Also going to use the plasma to cut the existing ends off of the hydraulic cylinders mentioned above. Given all this that has been rattling around in my head all week, looking forward to a weekend to get a first crack at it, any advice beyond "Just do it!"? Well I am sure many people will all have differing opinions on all this. My 2 cents as a hobby welder: When you weld new ends on cylinder for real, be careful of getting the internal seals too hot and melting them. I guess short of dismantling it, extend it all the way and protect the shaft from splatter. Possibly wrap some sort of heat sink around the shaft at the opposite end. I know the rod you bought is rated for AC and DC, but not being a pro and just taking advice of others, I have found 6011 to be better on AC and 7018 to be better on DC. My dad always says odd numbers AC even DC? 6011 gives very good penetration but an uglier weld so I run it on the lower pass to get deeper and then 7018 on top to be pretty, and stronger. I am relatively new to 7018, just finishing my first 5 pound box since I did not have a DC machine before. I used to use 6013 for pretty stuff. My 7018 runs beautifully but once you stop, it is a pain to start again compared to 6011 and 6013. It seems the end coats over with slag and you will see how miserably hard that slag is compared to the 60xx rods. Certainly thicker is easier especially for 6011. I run my 7018 1/8 inch around 140- 145 amps dc and 6011 1/8 around 125 ac. for thicker metals. Question, how confident are you with puddle recognition? Can you identify the molten metal vs molten flux? For stick welding puddle manipulation is all about the recognition of what's happening as you move the molten pool along the material. My recommendation is to use a thicker piece of material, say 3/8 or 1/2 thick and practice running stringer beads until you can get them at a consistent thickness and shape. The reason I'd recommend the ticker material is because it won't heat as fast, allowing you to put down several passes and to fine tune your technique without having to adjust for the thermal issues. (More practice runs before the next piece). There are many texts out there that will show the rod angle and discuss the rod manipulation. I might also suggest that you start with DC positive polarity and E6010 --- It just runs nicer than the AC 6011. Low Hy is fine after the practice with the 6010. In my opinion 6010 is much more forgiving when it comes to beginners. The point is to start with flat beads/welds before you move to the filets. One last point --- get comfortable. This will become extremely important as you move to out of position welding, (something other than flat welds). Then it's all about practice, practice, practice and having fun! Thanks for the advice, that all makes a lot of sense. I will pick up some E6010 rod. What diameter do you recomend for practice on 3/8" or 1/2" scrap? I decided to bite the bullet and try something productive right off. I cut up some 1/8" plate that I have a lot of. Cut out a pattern with the plasma cutter, and welded up a two piece bracket to bolt my TNT control valve to the ROPS with some 3/8" rectangular U-bolts. I'll have to put up some pictures. 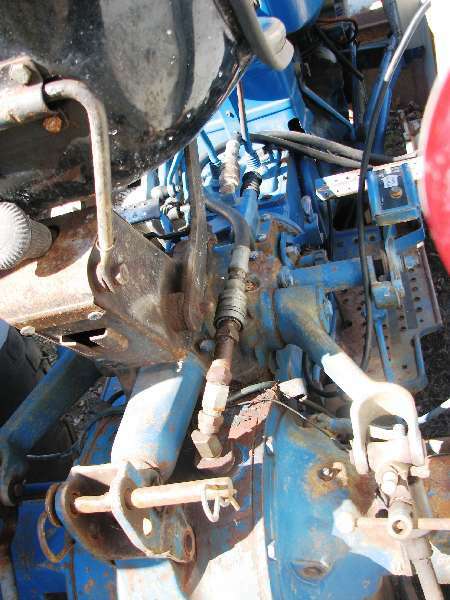 It's too complicated to describe very well, but it mounts the valve to the ROPS at a 45 degree forward tilt with the back of the valve mostly behind the ROPS so that the hydraulic fittings are right where I need them. It also compensates for some of the ROPS outboard tilt. Well anyway, back to welding: I used some E7018, and didn't have too much trouble. I managed to get some real strong welds without making too big a mess. It did require a bit of grinding to clean up the mess I made, but the result is quite functional, if several miles short of professional. I guess I like the philosophy somebody else proposed: (paraphrasing) "Do something useful, do it the best you can, and if it comes apart do it again better the next time." I'll put some pictures of the finished product later, but I was pressed for time and didn't get any in the process. But, I do like your advice and am going to follow it. Doing that job convinced me that I don't have a good feel for the puddle control. I probably did everything wrong; tilted the rod the wrong way, didn't move the rod tip around enough, forgot to keep moving the rod in closer as it got shorter, etc. But I actually got some very stout welds, didn't make any holes where I didn't want them (well one little one, but as the design evolved, it ended up in the scrap pile anyway). Anyway, my TNT valve is mounted right where I wanted it. With a little JD green paint it'll look great. I won't list the types of coatings here, you can get that off the consumable carton. Just one other comment, don't leave open boxes of rod laying around. The moisture content of the rod has a lot to do with the quality of the weld you can produce. AWS does not allow rods to be left to the atmosphere for more than two hours without re-baking them. If you do have open consumable cartons, and an understanding wife, bake the rods in your oven at 250 degrees for two hours before using them. You can rebake them as many times as you need to. Dry rods will help you create consistent weld pools and profiles. Your 6010-DC/ 6011AC rod is a deep penetrating rod which is good for root passes on rusty dirty base metal. Normally it is best to "stitch" weld with these rods which takes practice. The 7018 rod is basically a cover rod. It doesn't dig deep to get rid of porosity or go through rust. It does put a nice looking cover on your root passes especially if you do a weave. A good beginner rod is the 6013AC rod. It's between the 6011 and 7018. It doesn't do anything great but it's one of the easiest rods to use. Remember that 7018 is a contact rod; if the arc length is too long, impurities will enter and leave visible porosities in the weld. Done well, these will make a beautiful weld. They were recommended to me for use on high-carbon steels, with my AC-only welder. Also had a batch of these rods that weren't in a sealed container, and made ugly welds. Dry rods helped a lot. I don't like the spatter of 6011, had trouble getting them to strike on my 110 welder, so never used them again. I prefer 6013, even with my 220 welder. 7018 is the most commonly spec'd rod for structural welds with low carbon steels, like structural shapes. About every spec we deal with calls for 7018 rod. It produces quality welds in any position, and can be easily quality controlled in the field. It can be run AC or DCEP. It also has the advantage of easy slag removal. Should be a good all purpose rod for mild steels. Here is some good basic info on rods. Here is another link to some basic welding info from ESAB.